We forecast 6–9% returns for the S&P 500 in 2017, commensurate with expected earnings gains. As investors increasingly trust that the economy can stand on its own without the need of monetary policy support, business fundamentals should take over as the primary market engine. The economic expansion is poised to continue, and powered by business fundamentals, this eight-year-old bull market will probably continue as well. We think stocks are in a good position to stand on their own as monetary policy support is removed and deliver modest additional gains in the second half of 2017. We forecast 6–9% returns for the S&P 500 Index in 2017. As investors increasingly trust that the economy can stand on its own without the need of monetary policy support, business fundamentals should take over as the primary market engine and corporate profits will take on increasing importance. We have slightly raised our 2017 S&P 500 Index total return forecast to 6–9%, commensurate with expected earnings gains. As investors increasingly trust that the economy can stand on its own without the need of monetary policy support, business fundamentals should take over as the primary market driver. As a result, corporate profits will be increasingly important for stocks over the balance of 2017 and into 2018. Our confidence that earnings growth will come through over the balance of the year has led us to slightly raise our 2017 S&P 500 Index total return forecast to 6–9%, up from mid-single-digits previously, driven by: 1) a pickup in U.S. economic growth; 2) mid- to high-single-digit earnings gains; 3) a stable price-to-earnings ratio (PE) of 19–20; and 4) prospects for a fiscal policy boost to earnings in 2018. Over the past three years, operating earnings for the S&P 500 have been basically flat, at around $118 per share. Consequently, market returns over this period have been largely due to the combination of PE ratio expansion and dividends. This dynamic has already begun to change. In 2017, we expect solid gains in corporate profits, driven by potential improvement in economic growth, resilient profit margins, a stable U.S. dollar, and rebounding energy profits. We believe S&P 500 earnings growth near 10% is attainable, putting earnings for the index in the range of $130 per share, even without any material impact from fiscal policy changes this year. Corporate America is off to a good start toward hitting our earnings target. First quarter earnings season was a very good one, with S&P 500 profits rising by a much better than expected 15% year over year (Thomson data) [Figure 1], while company guidance for the remainder of the year was also positive. The bar for growth was fairly low, as the comparison was relatively easy considering the struggles of early 2016, particularly in the energy sector. But even excluding the strong contribution from rebounding energy sector profits, S&P 500 earnings were still up over 10% year over year in the first quarter. Even if the earnings trajectory slows some over the course of the year as comparisons with 2016 get tougher, business fundamentals may still point toward further growth in output and profits. We look for stocks to see gains commensurate with profit growth, consistent with historical mid-to- late economic cycle performance. At 19–20 times trailing S&P 500 earnings, stocks are expensive relative to their long-term history. 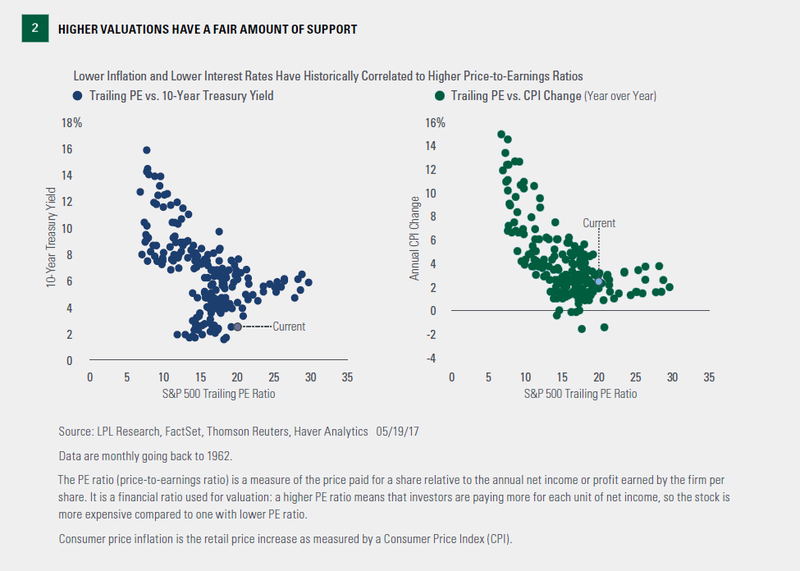 However, when viewed against interest rates and inflation still near historic lows [Figure 2], valuations look fair to us. Moreover, the potential policy upside to earnings in 2018 on top of an already upward trajectory for corporate profits could provide further support for equities. Remember, history is littered with examples showing that valuations have been poor predictors of one-year stock market performance. Additional clarity on corporate tax reform in the coming months will provide further insight into 2018 profit growth and potentially justify elevated stock market valuations. In fact, although we have little more than a high-level framework to go on as June begins, the potential exists for corporate tax reform to boost S&P 500 earnings by 5% or more in 2018, with the obvious condition that the Trump administration and Congress can come together on a package that can get enough votes to pass the House and Senate. Far from a slam dunk but still, we believe, more likely than not. While accelerating earnings growth may provide further support for stocks, challenges implementing President Trump’s agenda and additional Fed rate hikes could lead to periodic bouts of stock market volatility and may prevent stocks from adding meaningfully to year-to-date gains. Fiscal policy is therefore a wildcard, but meaningful progress toward implementation of corporate tax reform could provide upside for corporate profits in 2018, adding potential fundamental justification for forward PE ratios. Investors should feel good about where the stock market is as the halfway point of 2017 approaches. The economic expansion is poised to continue, and powered by business fundamentals, this eight-year- old bull market will probably continue as well. Fiscal policy may not help much this year, and there may be bouts of volatility as monetary conditions tighten further, but we think stocks are in a good position to stand on their own and potentially deliver modest additional gains in the second half of 2017. IMPORTANT DISCLOSURES Commodity-linked investments may be more volatile and less liquid than the underlying instruments or measures, and their value may be affected by the performance of the overall commodities baskets, as well as weather, geopolitical events, and regulatory developments. Currency risk arises from the change in price of one currency against another. Whenever investors or companies have assets or business operations across national borders, they face currency risk if their positions are not hedged. Because of its narrow focus, investing in a single sector, such as energy or manufacturing, will be subject to greater volatility than investing more broadly across many sectors and companies. The opinions voiced in this material are for general information only and are not intended to provide specific advice or recommendations for any individual. To determine which investment(s) may be appropriate for you, consult your financial advisor prior to investing. All performance referenced is historical and is no guarantee of future results. The economic forecasts set forth in the presentation may not develop as predicted and there can be no guarantee that strategies promoted will be successful. Investing in stock includes numerous specific risks including: the fluctuation of dividend, loss of principal, and potential liquidity of the investment in a falling market. All investing involves risk including loss of principal. A Technical Check-In: The Global Bull Looks Strong.